Most people are concerned with the question of whether their eye surgery will be painful. There are few people who are not fearful of this thought and how they will deal with eye surgery particularly if the surgery is going to be performed under local anaesthetic and they will be awake and alert for the procedure. 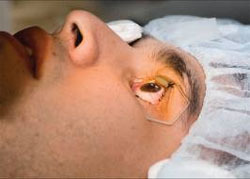 Eye Surgery is usually not painful, however it may be uncomfortable. Local anaesthetic is applied to the surface of the eye in the form of eye drops which can be used throughout the procedures if needed to ensure that pain relief continues throughout the procedure. Some patients requiring extensive surgery or young children or adults who are excessively anxious about the procedures may be offered a general anaesthetic and will sleep through the procedure. This is not normally offered for most conditions that are easily treated in a day hospital or out patient’s clinic under local anaesthetic. Laser surgery in the past, has at times and for some patients, been long and may have seemed very uncomfortable. New techniques have significantly improved the way laser surgery is performed and in many cases a procedure that used to take half an hour to perform now takes approximately 5 minutes (for example.. treating diabetic retinopathy) and the patient experiences no pain and only a slight discomfort if any discomfort at all. Whether or not a patient experiences any pain or discomfort during the procedures, simple pain relief such as Tylenol, will be prescribed by a doctor to ensure that the patient remains as comfortable and pain free as possible. The latest techniques provide relatively pain free treatments that are quick and efficient and produce very little bruising or discomfort either to the affected and treated eye or the surrounding regions, even in cosmetic surgery to improve the appearance of the eye or the eye lids. Anxiety can reduce the pain threshold and increase pain sensations so it is vital that patients are fully aware of what the doctor will be doing and what to expect prior to a procedure. It is useful for patients to discuss any concerns they have with their doctor and if there are any fears, patients should express them to the doctor so that the doctor is aware of them prior to the procedure taking place and can work towards alleviating them before, during or after the procedure. Is Eye Surgery Painful for Children? Most parents worry about how their children will deal with eye surgery. The most common surgery required is for cross eyes or strabismus and this requires surgical correction of the eye muscles. For most children, the procedures required will be done in hospital and under general anaesthetic but children will still wake up post operatively and need care and support to deal with their post-operative recovery. Most children will express they feel pain immediately post operatively but this will significantly and rapidly reduce as each day passes post operatively. Children are prescribed pain relief to help them remain calm and pain free and recovery is usually rapid.